daveha11 August 6, 2018 August 6, 2018 They promised us ... the Guardian, 2018. The fragile apparition endured only long enough to say: “Help me Obi Wan, you’re my only hope” before flickering out. But R2D2’s 3D projection had given millions of young eyes, including mine, their first taste of holograms, and probably unrealistic expectations of a future playing gruesome games of holographic chess. After all, the concept was already quite familiar even on Earth, invented in the 1940s by physicist Denis Gabor. But when the force awakened some 40 years later, Star Wars folk seemed to be using the same kit and, back on Earth (oddly enough) we hadn’t really moved on either. 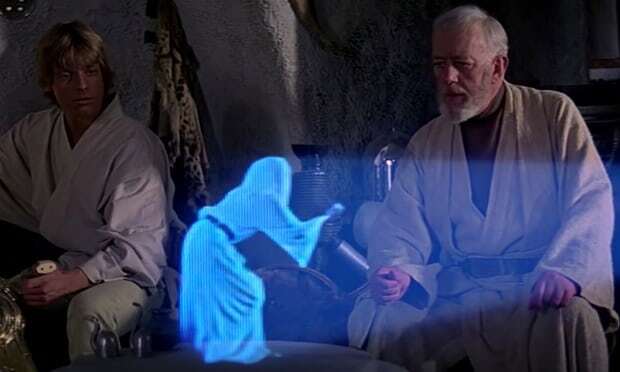 Why aren’t real, moving, Leia-style holograms now part of the daily furniture? That depends on your definition of a hologram. We have made astounding strides in 3D television and in virtual reality, and in the eye-twistingly complex world of computer-generated holography (CGH) – simply put, a way of recording and reproducing 3D images on a medium like standard images on film. Getting those images to move is a huge challenge, as we will see. What the the rest of us probably want to see is an independent 3D image you can see from any angle, ie, one that behaves like any solid object – what some scientists are now calling the volumetric image. And special headgear or glasses somehow seems like cheating. Obi Wan didn’t need them. Of course, we are already using 3D technology, from autocad and ultra-realistic remote conferencing, to medical technology that allows surgeons to operate remotely or students to learn anatomy. Indeed, 3DTV already seems to have had its day. A market opened up for the technology a decade ago, at first using the familiar glasses, then using a much-improved “autostereoscopic”, technology to allow the images to leap out of the telly. But it only worked at certain angles. The market may have sniffed a gimmick, realising that – hold on, we can already naturally see in 3D and desrted the idea in droves. Now it’s all about UHD, and, of all the major manufacturers, only Samsung are bravely beavering away on a new approach to 3DTV, using lasers and eye-tracking tech. Presumably this does away with the parallax problem above – but whether people will want to watch it is another question. But wait. Didn’t I see rapper Tupac eerily brought back to life at a festival somewhere? You did, but you didn’t see a hologram. The image you see isn’t even 3D – and the idea is far from new. The trick has been around since the early 19th century, used to ‘magick’ up fairground hauntings, using what’s called the Pepper’s ghost effect. These are simply images projected on to a semi-transparent screen against a dark background. Admittedly, the modern variety’s ability to interact does kick the effect up a notch – so if you are impressed, some companies will even sell you one. There’s even a rumour that Roy Orbison could make a ghoulish comeback at Glastonbury 2019 – in glorious 2D of course. The work being done by the University of Southern California Institute for Creative Technologies comes really close to the Leia effect with its rather eerie interactive 360º light field display. It works by projecting light on to a rapidly spinning mirror, reflecting an eerie blue 360º image of a head that can be turned about and viewed from any direction you like. Sony liked it so much it used the tech for its prototype Ray Modeler 360º colour display, an tube-shaped appliance that wouldn’t look out of place in any living room. But Princess Leia didn’t need a tube, and so far a more realistic use for this technology is not in entertainment but teleconferencing. Again, Sony is running with the ball on this so-called 3D telepresence: it takes an image with an array of cameras focused around an object, which is then transmited using ethernet. This allows lifesize, real-time global telecommunication in 3D ... those S.H.I.E.L.D. meetings in Avengers are nearly a reality. Sony’s Ray Modeler 360-degree display. I can’t wait that long for my game of chess. Now, it may never be possible to whiz up an image like Leia’s in thin air, as photons simply don’t like to do this. But Brigham Young University researchers and their incredible volumetric image come close. Writing in the journal Nature in January 2018, assistant professor of electrical engineering Daniel Smalley shows how the technology uses lasers to move tiny particles around in the air to create the illusion of solid lines, like writing with a bonfire-night sparkler. It can generate images – though tiny at present – at up to 1600 dpi. To create larger images they are working on ways to manipulate multiple images at once, but the technology may still be years away from daily use. All these ideas share a drawback: they’re all sensitive to vibration and air turbulence, and at present, they’re all pretty simple images. Like the 3DTV, we’re far, far away from the sort of colour, resolution and contrast required to push these images beyond the merely novel. But it already has a future in the fields of remote surgery and telecoms. And soon – who knows – lifelike games of chess. (PS: If you can’t wait until 2046 to see a hologram, you can make one yourself with your smartphone and a reflective upturned pyramid. Check out YouTube for examples).